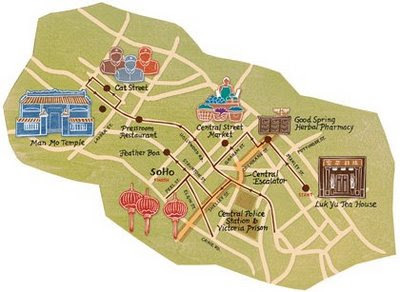 In April I was contacted by Jessica Yu, the graphics director for Wall Street Journal Asia, to work on a map of Hong Kong for their monthly "City Walks" column. Jessica gave me a written itinerary of the walk and a number of photographs of landmarks that would be visited along the way. Jessica was drawn to the woodblock work I have displayed on my web site, so although we agreed that I wouldn't have the time to do the entire map in woodblock I promised to use moku hanga at least for the background. First I made a tight sketch and got it approved. Then I scanned my sketch and cut a block for the streets. I printed the block in a color close to the color I thought I would want on the final, knowing that I could adjust the color later when I composed the illustration on the computer. The map would also have small icons marking the locations of various tourist sites, so I decided to try doing a white line woodcut for those small illustrations. I carved the simple lines and then printed the block all in one color. This way I would have the lines and the woodblock texture and I could adjust the colors digitally. And here's a closeup of the icons after I changed the colors with Photoshop. To finish the piece I scanned and added hand lettering and the walking route. All in all, I liked how it turned out, and I especially like the hint of wood texture that's visible in the background. I started printing the Mexico Border print today. For financial reasons I've been using Rives Heavyweight paper for my most recent moku hanga, but today I did a few first impressions on some Echizen Kozo, and I remembered why I love this paper. Compared to Rives it takes way less baren pressure to make a good impression, it has much more character and luminosity, and the printing surface is extremely smooth. It's delicious paper, and I'll be using it for this entire series of prints. Also for financial reasons, I've decided to work with the reduction method as much as possible (recutting the same block over and over as opposed to using a new block for every color). I'm using 18" x 24" (45.7 x 61 cm) shina plywood blocks at $25 each for these large prints, so the reduction method will allow me to use just 1 or 2 blocks for each print. This will be a small edition of 15 prints or less. The three impressions in the photo above were taken from an uncarved block, using acetate to mask off certain areas. Then I drew on the block to guide the first carving. This week I'm starting out on a new printmaking journey, a series about borders. I'm especially interested in political borders, past and present, where human beings have built fences or walls in order to keep out other human beings. I'm starting close to home with the 1,952 mile-long (3141 km) U.S.-Mexico border. Currently a series of unconnected separation fences exist, mostly in urban areas. Around five thousand people have died or been killed trying to cross the border in the last thirteen years, according to a document created by the Human Rights National Commission of Mexico, as the fencing in urban areas forces illegal immigrants to attempt desert crossings. In October 2006, President Bush signed a law authorizing and partially funding the construction of an additional 700 miles (1,125 km) of physical fence/barriers. Objections to the fencing as proposed include charges that it would divide three Native American nations, would divide the University of Texas at Brownsville into two parts, and will block river access and destroy essential vegetation for many native and migratory species. The longest portion of the new fence, 361 miles, would be along the Arizona-Mexico border. I've selected a satellite view of the border at the popular border city of Nogales, Mexico, which is separated from her sister city, Nogales, AZ, by a 15-foot high fence. 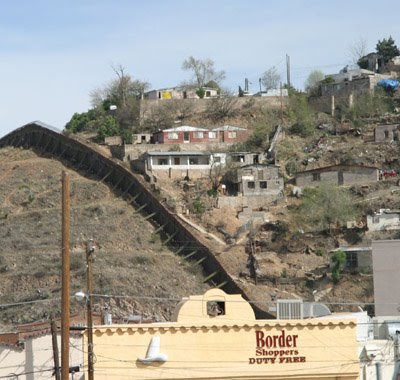 A great article by Kevin Clarke about the effects of the fence on Nogales can be found by clicking here. The satellite view I've chosen as my starting point is at the eastern portion of Nogales where you can see that the Mexico side of the city is much more densely populated than the U.S. side. The current fence, surplus from the Gulf War, was erected in 1995 and is so effective that most who want to cross now head east a few miles out of the city where the fence trails off. Also to the east of Nogales about 30 miles is the place where the Spanish explorer Coronado crossed into what we now call the American southwest in his search for the fabled city of gold, Cibola. I'm hoping to work a little more loosely with this print than I did with the Three Prophets. I have some visual elements I may include (fence climbers, border helicopters, conquistadors), but I'm not sure yet how they'll all fit together. The prints will be 22" x 14" (56 x 35.5 cm) on 26" x 19" Japanese paper. Ever since I first conceived of these three prints I pictured them hung like scrolls above my sofa, so this week I mounted three artist's proofs in a scroll-like way. I used two pieces of flat-with-rounded-edges moulding and some little screws to sandwich the prints and added some maroon cord for hanging. As my friend illustrator David Pohl said to me, "If you built it, they will come." I'm happy to have such good company in my living room with me. Found this cool little music video by José Gonzáles via the Cullom Gallery blog Megane. What fun, to be inside a woodblock print! Gonzáles' music is pretty fine, too. For anyone traveling to Cape Cod this sumer, Provincetown is once again host to a number of white line woodblock opportunities. 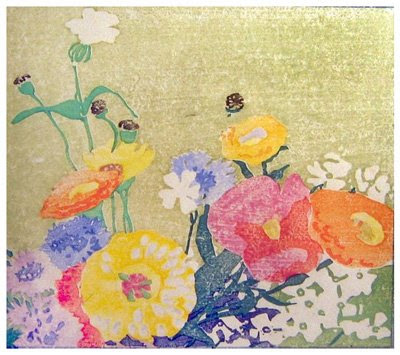 A collection of 50 color woodblock prints by Edna Boies Hopkins will be on exhibition at the Provincetown Art Association and Museum, June 13 through Aug. 3. Curated by Dominique H. Vasseur, the exhibition is intended to show “the artist's evolution toward modernism.” PAAM is located at 460 Commercial St., Provincetown. Also at PAAM will be two different classes in "white line printmaking," the technique that Hopkins used that was developed in Provincetown in the early 20th century. And the Julie Heller Gallery is a place where there are always examples of Provincetown white line prints as well as many other works by artists who have passed through this beautiful Cape Cod art colony. The title of this triptych has evolved into "Three Prophets." Here's a composite of the three prints, none of the shots well-lit or well-taken but it shows how they all look together. Tomorrow I'm taking them to my favorite local photographer, Stephen Petegorsky, to have proper photos taken. It was only my love of this concept that got me through the making of these prints. The carving on these was grueling. I didn't keep careful track, but I would guess that I spent at least 80 hours (probably more) just on carving for each print. The whole thing from start to finish took nearly 8 months, a huge commitment for me. I think that I may sell a few of them individually, but for the most part I want to sell them as a set. I think they work best that way. One of the things I was curious about at the beginning of this project was what, if anything, each geography might reveal about the religion that was born there. I did find some resonances. The watery/wind-like shapes of the land around Bethlehem reminds me of Christianity's mysterious Holy Spirit; Mecca's roads leading to the city center emphasize the role of pilgrimage in Islam; and the perfect rectangle of the garden in Nepal where Buddha is said to have been born echoes the promise of enlightenment. I'm very happy with these prints, and one set will have a place of honor on my living room wall. Well, over the next couple of days I'm going to be using moku hanga for a commercial client for the first time. Part of the work will be digital, too, but the basis of it will be a print-- a map for Wall Street Journal Asia. I'll show it to you after it goes to print in mid-June. 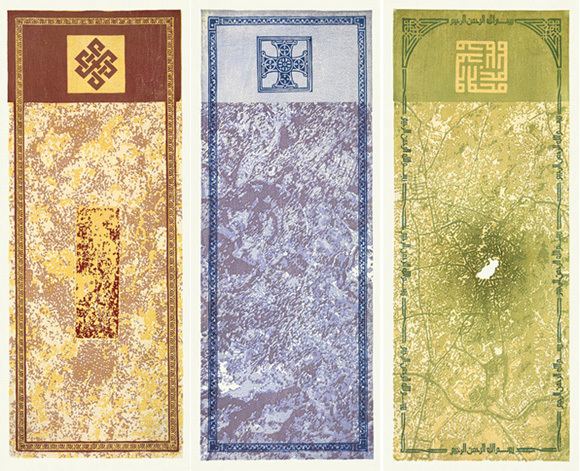 And after that I have a new series of map-based prints in the planning stages that I'll be working on over the summer. There might be four or six prints in this upcoming series, I'm not sure yet.